​Ninety years after the launch of the very first Farmall tractors, a success around the globe on account of their reliability and versatility; Case IH is re-launching the famous brand on an all new line up of tractors which share those exact same attributes. The Farmall C, Farmall U and Farmall U Pro series are shortly due to hit our shores, and will undoubtedly reassert Case IH’s position as a true heavyweight in the utility tractor segment. All three series feature the same brand new 3.4 litre electronically controlled high pressure common rail engine developed by sister company FPT (Fiat Powertrain Technologies), a leading global supplier of engines, axles and transmissions for the industrial sector. Incorporating a wastegate turbocharger and intercooler, this responsive new engine features Cooled Exhaust Gas Recirculation (CEGR) technology which lowers the temperature of the exhaust gases, then blends them with fresh air and returns the mixture to the cylinder to maximise combustion efficiency. The engine also features a new Diesel Oxidation Catalyst (DOC) and maintenance-free Particulate Matter Catalyst (PMC) technology which automatically burns off particulates in the exhaust gases, thereby ensuring that the system remains clean and operates at peak efficiency. Dramatically improved fuel economy, less noise and vibration, greater lugging ability and a more constant power curve are all characteristics of this impressive new development from FPT. 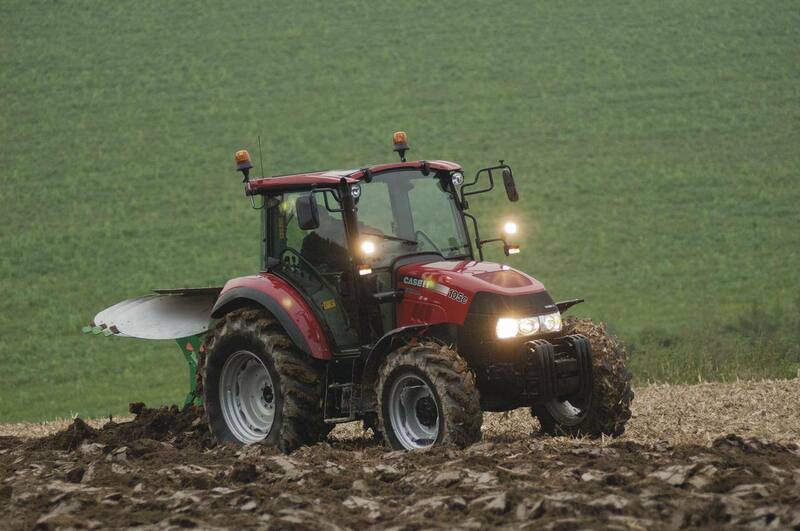 ​"These tractors will undoubtedly reassert Case IH’s position as a true heavyweight in the utility tractor segment." The Farmall C is a completely new series with four models spanning the 85 to 115 horsepower range. Introduced as a replacement to the hugely successful and longstanding JXU series, this medium duty workhorse is the perfect all-rounder, capable of a range of tasks typically found in New Zealand livestock farming operations. It features impressive manoeuvrability, an outstanding power-to-weight ratio and strong hydraulic performance, plus superb all-round vision to the key working areas. Paired to the new common rail engine is a 24x24 gear synchromesh transmission with two speed powershift, power clutch and electro-hydraulic powershuttle (wet clutch), capable of up to 40kph. For specialist applications, an optional creeper transmission allows speeds down to 123 metres/hr. In the development of the Farmall C series, Case IH engineers focused on maximum driver comfort and ergonomics. The newly designed cab is fitted with a flat-deck platform and features best in class operator comfort and visibility. With a standard glass roof panel, forward visibility has never been better. Repositioned ergonomic controls and a redesigned instrument cluster will result in less operator fatigue and more productivity. The Farmall C comes available in 85, 95, 105 and 115 horsepower versions. Each can be chosen in either a ROPS or cab configuration. Like the Farmall C, the Farmall U series is also a completely new development, designed for those that require a tractor better suited to slightly heavier duty applications such as ground cultivation. The Farmall U is available in cab only configuration in 105 and 115 horsepower models. The transmission is a 16x16 semi powershift that will be familiar to those who have operated the larger Maxxum XL series of tractors. This proven transmission has been re-designed for the Farmall U and enables the driver to select up to eight gears via up or downshift buttons on the dedicated transmission lever without physically moving it. It is 40 kph capable at just 1870rpm, making it ideal for transport operations. What truly sets the Farmall U apart from the competition is the cab and operator environment. As a tractor suited to operators that spend extended periods of time behind the wheel, the Farmall U has been equipped with cab suspension as standard, as well as a passenger seat and Bluetooth high performance stereo system. There are further improvements and performance enhancements at the rear. Maximum lift capacity of the electronically-controlled linkage is up to 5,400 kg, with fingertip operation of all key functions, including float, transport lock and maximum hitch height. Unlike the Farmall C and Farmall U, which are both manufactured in Jesi Italy, the Farmall U Pro is designed and built at Case IH’s European headquarters in St Valentin, Austria. The Farmall U Pro is the premium offering in the Farmall range, offering many features normally found only on much larger machines, such as a programmable automatic gear shift, electronic remote valves with an integrated joystick for front end loader work and a four speed PTO. The Farmall U Pro is an economical machine thanks to its numerous “big tractor” features like the 100L/min closed centre load sensing hydraulic system, it only pumps oil on demand; eco PTO speeds and the tractor reaches 40km/h at only 1750rpm. The new operator friendly premium cab has mechanical cab suspension, heated air suspended seat and low noise levels, as well as light and easy controls to ease the working day. The new Multicontroller provides the operator with the most commonly used functions at their fingertips, including power shuttle, gear shifts, rear hitch, remote valves and two constant engine speeds, as well as a power clutch. The exclusive new 32x32 gearbox was developed in partnership with ZF and is also built in Austria. It has a four step powershift with four shift modes; with the dual throttle, the shift point can be programmed according to engine load and speed- lower for loader work and higher for heavy draft work. There are options of factory loader ready, integrated front hitch and PTO as well as specialist municipal hitches available to fit any need. Available in 105 and 115 horsepower, the Farmall U Pro defines the Farmall name - whether dairy, drystock, cropping or contracting the U Pro fills a gap in the market for a compact, highly specified premium utility tractor.